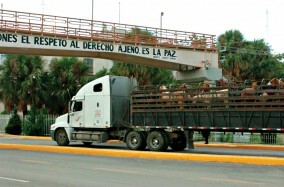 Since the closure of U.S. slaughter plants, horses ship across the borders to Canada and Mexico for slaughter, with 137,984 making one-way trips in 2010. Photo courtesy of Kathy Milani/The HSUS. For horse people, there are few topics more controversial than slaughter. When a government report was released June 22, it didn’t tell anyone seriously involved on either side of the debate anything they didn’t already know. But the report did frame the situation perfectly by recommending either closing the channel of slaughter from the United States or re-opening domestic slaughterhouses. Depending on which side of the debate you’re on, one of those recommendations likely expresses your best-case scenario. People on both sides of the pro/anti-slaughter debate tend to agree that since all three slaughter plants in the United States closed in 2007, the situation has gotten worse for the horses—they make longer trailer trips with less government regulation. But having agreed on that, the next step is the subject of great discussion. Louisiana Senator Mary Landrieu (D) and South Carolina Senator Lindsey Graham (R) introduced a bill called the American Horse Slaughter Prevention Act of 2011 on June 9. It would officially ban slaughter in this country while also outlawing export of horses for slaughter. U.S. Reps. Dan Burton, R-Ind., and Jan Schakowsky, D-Ill introduced a similar bill in the House of Representatives on September 19. At the height of horse slaughtering in this country, when the meat was still used in dog food, there were 35 rendering plants. The number started decreasing after the 1966 Fair Packaging and Labeling Act showed consumers the amount of horsemeat their pets were eating; there were 16 plants open in the 1980s and seven in 1994. As late as 2006, two foreign-owned slaughterhouses remained open in Texas and one in Illinois, with all the meat being exported to Europe and Asia. In 2006, a provision in a U.S. Department of Agriculture bill prohibited federal funds from going to inspect the horse slaughter plants. Though the facilities stayed open into 2007 by paying for the inspections under a voluntary fee-for-service program started by USDA in February of 2006, respective state laws in Texas and Illinois formally stopped slaughter in 2007. While there’s no explicit ban on slaughter, the current lack of funding also doesn’t allow more plants to open. When the last U.S. slaughterhouse, Belgian-owned Cavel International, Inc. in DeKalb, Ill., closed in September of 2007, it was the end of slaughter within these borders. Before the last of the plants closed, slaughter proponents (including the American Association of Equine Practitioners, the American Quarter Horse Association and the American Veterinary Medicine Association) expressed concerns about the unintended consequences of eliminating an inexpensive option for horse owners to dispose of their unwanted horses. But the pipelines to Mexico and Canada—where the USDA estimates 32,789 horses were sent for slaughter in 2006—just grew busier. In 2009, 109,487 horses were exported to Canada and Mexico marked for slaughter, and in 2010, 137,984 made one-way trips across the border. The 2010 number of horses exported for slaughter (137,984) is nearly equal to the combined amount slaughtered in the United States, Canada and Mexico in 2006 (137,688), the last full year the domestic plants were open. While no horses are currently slaughtered in the United States, there are still rendering plants where pet food and other products like glue are made from their corpses. The horses are hauled to the rendering plants after they’re already dead, so the Federal Meat Inspection Act and subsequent ban on funds for inspections don’t cover the industry. There are also three plants where horsemeat is imported for repackaging and distribution and then sold to zoos and circuses to feed the animals. This is the first article in a four-part series, which will run every Wednesday through Oct. 26. The original version of this article was published in the July 18 & 25, 2011, Horse Care Issue. If you enjoyed this article and would like to read more like it, consider subscribing. Check out the table of contents to see what great stories are in the magazine this week.